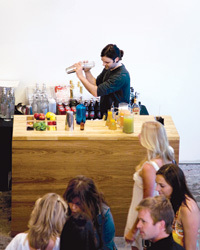 In San Francisco, Greg Lindgren and Jon Gasparini’s Rye on the Road serves fresh artisanal cocktails for as many as 1,000 people (ryeontheroad.com). Bargain Glassware: “The Ross Dress for Less glass section has some great finds.” rossstores.com. Must-Have Ingredient: “Dolin Vermouth de Chambéry Blanc is fantastic in a Negroni.” $15 for 750 ml; alpenz.com.